On his first morning home from the hospital I listen to the sound of my husband walking, bare feet padding determinedly along the floor. I am reassured by the sound of his footsteps tracing a back and forth route from the laundry room at one end of the house to the kitchen at the other. Instructed to walk a mile every day of his convalescence, he is dedicated to the task. He walks the route several times throughout the day. After a few days his stride picks up, his heels land stronger, with force enough to rattle the small things cluttering the table and the desktop. A few days more and he graduates to walking the driveway. I cannot hear his footsteps outside. I realize I miss the sound. Weeks before my husband’s surgery, we began walking. We needed the time together, the closeness, the exercise – all of it to be ready for whatever was to come. Yesterday, the thirteenth day after his surgery, he had the catheter and staples removed. There is still work ahead to get him back to where he was, but I look forward to our renewed walking in the evening again. And I realize that that is the thing that has gotten us to where we are, that looking outward in the same direction. Here’s to us walking, looking outward together for thirty more. I was raised Catholic. After decades of soul-searching, my religious beliefs have come to fall in the category of atheist. However, I do believe fervently in treating all living creatures with courtesy and respect. Treat others as you would wish yourself to be treated. I often fall short of that, but I keep trying. Original photo by Barbara Johansen Newman. Futzed with by me. The stage was set, the performance about to begin. Cupid aimed his arrow at Véronique. She was not a willing participant in this grand guignol. Alas, poor Yorick, wearing a wretched grin — his was not a speaking role, stuck as he was between la dame and the ridiculous Louis, whose eyes rolled relentlessly heavenward. The bit players barely noticeable at the back. All of them waiting for the houselights to dim. As they did every day, except for Sunday when the public attended church to confess the sin of misplaced curiosity. At the front of the stage, there was no mask to represent comedy. Tragedy was the only play held here. n.b. My friend Barbara is currently on a Viking River Cruise. She’s been generous in sharing her photos with those of us who are stuck at home. One of the places she visited was Český Krumlov in the Czech Republic. There were a couple of museum-y kinds of places with large collections of puppets and marionettes. This evolved from one of the photos she posted. My imagination ran a little wild. I am thinking of making my own strange tableau. As parents we keep trying to teach our children what we think they need to know to navigate their future. Our children keep learning about these people who claim to be their parents. They keep looking for answers to the questions we couldn’t or didn’t know how to answer. The point is we all hope for more. We strive for better. For safer. For ever more children willing to keep moving the world ahead in a way that safeguards humanity and our planet. Tomorrow I am taking my commitment to that pig-tailed Boy in the picture (pretending to be his favorite literary character of the moment) to the streets of Boston. So that I can raise my voice with others who wish that tolerance, love, and kindness may one day be the true law of the land. Reason enough to celebrate, I think. Let’s make some noise. *Or not. Not all humans feel compelled to heed the lessons inherent in life. For Shannon, always. And for his parents whose loss I grieve. 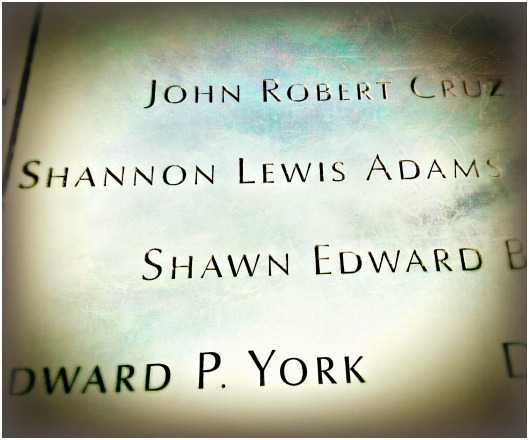 I never met Shannon Lewis Adams, but I woke up this morning thinking about him. I said his name out loud. On September 11, 2001, he was twenty-five, about the age that my son is now. A baby, still, his real life just beginning — the one his parents had spent years preparing him for. Nurturing him; encouraging him. Loving him. Fly, little bird, they may have thought then. Go out into the world and see what there is to see. And Shannon flew. To a lofty building far from home. I knew his father. We grew up in the same small area in the Adirondack mountains of northern New York. A place where most people are content to spend the whole of their lives. Lewis Adams had a shy sweet smile that traveled his face and was reflected in his eyes. I’ll bet his son Shannon did, too. Gazing at your infant son as he locks eyes on you, both of you as yet unused to such amazement. The reverence of such a moment. This is what you signed up for. This is what sustains you through long nights of wakefulness and days of wondering whether you’re doing it right–this parenting business–so necessary to keep the world chugging forward into a brighter future for us all. What a hefty weight a parent bears. Here. Let me remind you of the connection you made, long ago as it was. Let me show you how you have loved. p.s. Sorry about the coffee. Years ago I sighed suddenly. like a small bird tangled in a net. It kept happening after that. Occasionally, and out of nowhere. The sighs audible, gasping; a short stuttering note of surprise. breath I unconsciously hold mine. then wails from the surprise of it.